You Are Here: Home » Social Media, Sponsors » The New Handshake: Have Your Sales Met Social Media? The times are changing, this much is true. Whether you’re venturing into the mystical world of augmented reality, looking to cut down on the (seemingly) countless hours spent scheduling social media posts or hoping to take your existing ventures into new and emerging markets, it’s important to remember where it all starts: with a handshake and, ultimately, a business deal. The thing is, a handshake isn’t what it used to be. At least that’s according to Founder and CEO of Talent Builders, Inc. Barbara Giamanco. Giamanco, a sales and social media consultant, speaker and coach based in Atlanta, Ga., has spent the last thirty years working with companies to drive sales in an increasingly digitized marketplace. Her new book The New Handshake: Sales Meets Social Media tackles the changing demographic of the sales and business-dealing landscape head on. The best part is, in the true spirit of social sharing, you don’t have to drag yourself to a brick-and-mortar store to grab your copy. Sign up for the Talent Builder’s mailing list and you will land your very own e-copy in a matter of seconds. 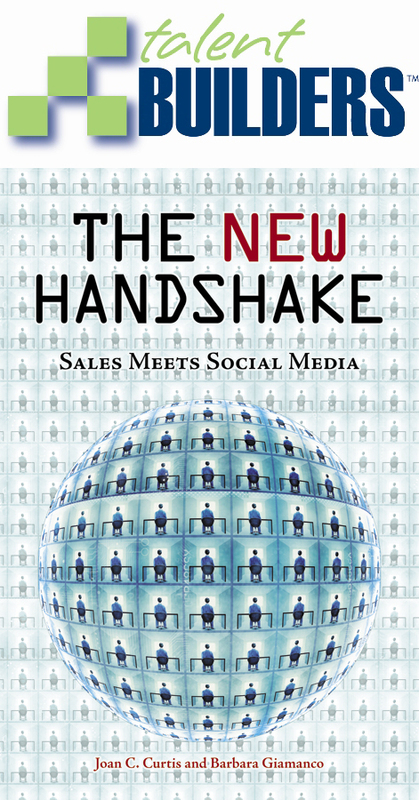 One Response to The New Handshake: Have Your Sales Met Social Media? Great advice from Barbara, 15 minutes in the morning and 15 in the evening, consistency is key when networking online. Social media will (most likely) never replace the handshake, but it can and will leed to more handshakes.